Increasing responsibilities requires one to intake more nutritious and healthy food. With so much to do, your body should get all the essential minerals and vitamins, since improper diets lead to weakness, fatigue and stress. Take precautions and have proper meals at the right time, since having very little food will not fulfil the bodys needs, leaving you sick and tired. This is a good example and a warning for your kids as you keep telling them repeatedly to eat healthy to keep fit and trim. Many people question the importance of healthy eating because they seemed to be fine not eating healthfully for many years. Then all, of a sudden, they don't feel well, they've been diagnosed with diabetes, heart disease or cancer or have some other health challenges. They don't understand it. What happened? Well, simply put, it's like this. We're born with a reserve to protect us against some of the assaults against our body. Think of it as a stack of $100 bills. Over time as we abuse our body, for example, by eating processed foods, junk food, unhealthy food, we spend some of those $100 bills. Eventually, if we continue eating unhealthfully, the whole stack will be gone. That's when we'll have big problems. We're no longer able to get away with the indiscretions that we could when we were younger. If you've already experienced this, you know what I'm talking about. If you haven't, your stack of $100 bills hasn't run out yet. But you don't know when it will. It could be tomorrow. It could be two weeks, or five or 10 years from now. But why take the chance? 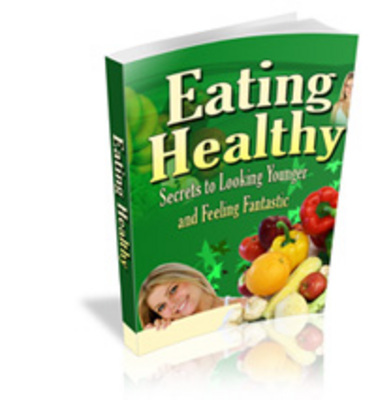 Eating Healthy is delivered in PDF format and is viewable on any computer. All you need is "Adobe Reader" or "Acrobat eBook Reader" which is available free and already on most computers. Golf Swing Secrets - Never Before Revealed Information!